Please send the book to the next person on the list (PM'ing them for their addy) within 1 month. If you are unable to finish the book in that time please let me know so i can keep everyone updated. 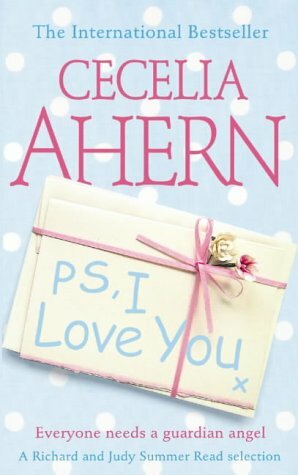 Cecelia Ahern's debut novel, PS, I Love You, follows the engaging, witty and occasionally sappy reawakening of Holly, a young Irish widow who must put her life back together after she loses her husband Gerry to a brain tumour. Ahern, the twentysomething daughter of Ireland's Prime Minister, has discovered a clever and original twist to the Moving On After Death concept made famous by novelists and screenwriters alike--Gerry has left Holly a series of letters designed to help her face the year ahead and carry on with her life. As the novel takes readers through the seasons (and through Gerry's monthly directives), we watch as Holly finds a new job, takes a holiday to Spain with her girlfriends, and sorts through her beloved husband's belongings. Accompanying Holly throughout the healing process is a cast of friends and family members who add as much to the novel's success as Holly's own tale of survival. In fact, it is these supporting characters' mini-dramas that make PS, I Love You more than just another superficial tearjerker with the obligatory episode at a karaoke bar. Ahern shows real talent for capturing the essence of an interaction between friends and foes alike; even if Holly's circle of friends does resemble the gang from Bridget Jones a bit too neatly to ignore (her best friend is even called Sharon). While her style can be at times repetitive and her delivery is occasionally amateurish, Ahern deserves credit for a spirited first effort. If PS, I Love You is any indication of this author's talent, readers have much to look forward to as Ahern matures as a novelist and a storyteller. This book is part of the Richard & Judy Summer read selection. Release planned for Thursday, June 24, 2004 at post office in snail mailed to a fellow bookcrosser as part of a bookring, Bookring Controlled Releases. This is my first bookring! I liked "PS, I Love You" a lot!! It is a true page turner. I guess what I liked most was that Holly's grieving process was shown very believably. The idea that Holly's late husband, Gerry, leaves messages for her to help her through the time after his death was so touching and clerverly done. One of the most moving scenes of the book is the one about the travel agency. All of the characters are truely likable and one starts missing them immediately after finishing the book. Oh and the bit with the German tourist didn't bother me at all. In fact I always try to avoid fellow Germans on holidays because unfortunately the majority of them are just impossible to bear! ALSO: I added a Hamburg Bookmark to the book for Caffcaff! Release planned for Wednesday, July 07, 2004 at Sent to another Bookcrossing member in controlled release, Hamburg Germany. Part of a Bookring. Sent to Loeweneckerchen! The book arrived safe and sound yesterday morning. Thank you! Finally finished it. Thank you all for letting me keep it for so long, and I'm really glad I got the chance to read this book. It made me cry and it made me laugh and I will definitely try and get a copy for my real bookshelf. It is a book worth reading again and again. Holly's feelings and her ups and downs throughout the year were described so well ... I sometimes thought that the author must have lost a loved one herself, because how could she write so true otherwise? I really liked the idea that Gerry had left ten messages for Holly to get her through the first year without him. It added a very interesting touch to the well-known story of losing a partner and having to live on. I will use the same envelope that Geegal used so that the enclosed bookmark (it's taped to the inside of the envelope) will reach caffcaff eventually. Well, off it goes ... across the big pond! Have a safe journey! This was really a wonderful read. It'll make you laugh, cry, and cheer for Holly! Thanks so much for sharing this one, caffcaff. Thanks so much for sending this -- I just received it and it is next on my TBR pile. What a refreshing book! My mom passed away last January and this gave me a small glimpse of what my dad must be going through. I appreciate Ahern's delightful sense of humor woven into the grieving process. on it's way to ellymae58!! Thank you, babykittysmama, for mailing it to me, and thanks caffcaff for sharing it! I'm just about halfway through the book, and am enjoying it immensely. I've already cried, and Girls and the City had me laughing out loud! Can't wait to see what the rest of the book has in store for me. Well, I'm finished! I stayed up to 2:30 a.m. to do it, too! I just couldn't put it down. I loved this story. I felt it was very realistic in the feelings and actions Holly had throughout the book. How wonderful that Gerry left those cards for her to open, and in a way was there to help her through the months after his death. I am going to be looking for more books by this author. I was searching on the internet, and I found these lyrics to a song by Bette Midler. The song is called "P.S. I Love You". I am including them here, as after reading them, I think they fit with the story. They seem like they could be from the viewpoint of someone who has died, and is speaking to someone they left behind, or vice versa. Finally on its way to ecmwfinswe on 12/9! Happy reading! Hi there! Now the book has crossed the ocean and arrived to Sweden today. Thanks! Well, this was a page turner! I liked the way it describes what true friendship is and how to deal with love and sorrow. Thanks for sharing caffcaff, the book will be back to you soon. oh how sad........ There is a "chick lit" style about this book and i could see Miss Ahern making a series out of Holly's life. It made me shed quite a few tears i can tell you! I dunno about these notes though, i mean i know that knowing she would have the notes to open every month kept her going by on the other hand did it actually prolong the agony? Whatever way, a great story, and as a debut novel, excellent! Will probably wild release this now or offer it up on the Relay site. What a lovely surprise to have these books turn up. My only problem is the temptation to add them to mount tbr. If you don't see another post for some time it is because I cannot resist - especially having read the reviews for it below. Just finished reading this in Buenos Aires while visiting my daughter. Was just going to realease it at the Hostel Inn where we were staying, but one of Sandra's friends, Cressida, who is in Paraguay for a year teaching in English wants to read it for a bit of light relief, so am leaving it in Ascuncion for her.